Condensation affects UK households which are poorly heated in the cold winters. 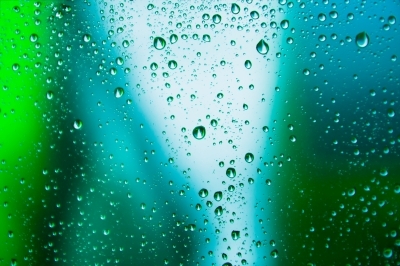 Tiny drops of water appear at the metal window frames or are soaked into the walls. They make your window frames rot and encourage the growth of mould. Mould increases your risk of asthma, allergies and respiratory diseases. It's time to protect your home from condensation. There is moisture in the air, even though you cannot see it. When the air is colder, moisture cannot be held any longer, drops of water appear at window frames. It is condensation. You notice this condition when you see steam at your mirror after showers. Due to our frequent activities, showering and cooking, condensation happens at the bathrooms and kitchens mostly. You may see water drops at cooler surfaces in the rooms, for example mirrors in bathrooms or metal window frames. But in some other cases, those water drops have been absorbed into the walls. You notice them once some annoying black mould patches growing from your walls. Pay attention to the following areas in your household: cooler surface areas near windows, mirrors in bathrooms, metal window frames. The most serious area in a flat is the kitchen together with the bathroom. Unheated rooms and areas behind furniture placed against outside walls should be checked for mould from time to time. How to deal with condensation? Compared to other dampness which is affected by different external factors, you can easily avoid condensation by simply changing your behaviour in your flat. You cannot avoid doing those normal household activities like showering, washing and cooking. But you can manage to protect your flat from condensation by not producing more moisture. A good habit is that, you don't dry your clothes inside the flat. Open the windows and remove water drops from the windows after showering. Close the bathroom door to stop moisture from escaping to other rooms. But it will be difficult to open the windows all the time during winters. Ventilate the bathroom more often is the best alternative. Check for black mould patches periodically, remove them completely by using special removers and then paint the areas with fungicidal paint to help to prevent them in the future. Close saucepans, use ventilators and close the kitchen door during cooking and steaming. Making rooms warmer is the best way to prevent condensation in winters. Do insulate your rooms and draughtproof the windows. Remember do not draughtproof your kitchen and bathroom. Good insulation using effective window frames and doubled glazed windows stops warmness from escaping from your flat easily, and also lowers your energy cost. Don't leave rooms unheated, even though there is no one inside. Try to maintain the average room temperature not lower than 15 degrees at all times during the winters. With over 15 years experience in the industry, You Choose Windows can supply steel windows to a variety of commercial and domestic clients.